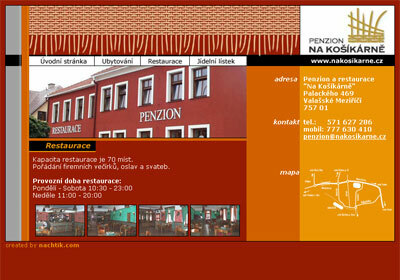 E-shop based on commercial product selling quallity Czech, Italian and French vines. Hair and cosmetics saloon specialized on hair extension and nail modelling. Company providing consulting service according insurance cooperating with all big insurance companies in the Czech Republic. Official dealer of Ate braking systems and brake spare parts for cars located in Prague offering full services. 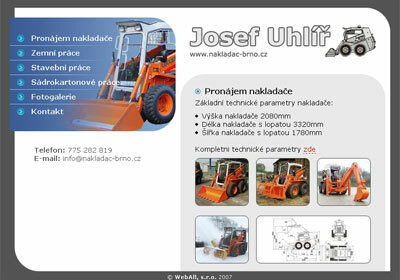 A small construction company renting loader LOCUST L 853 (UNC) and providing ground and construction works. Slovak portal providing personal profiles, chat rooms, fotogaleries and forums for calssmates in Slovakia. Restaurant offering wide sandwich and baguette assortment in Slovakia capital Bratislava. A small cosy pension situated in Valašské Meziříčí, Czech Republic invites tourists and offers high quality accommodation.